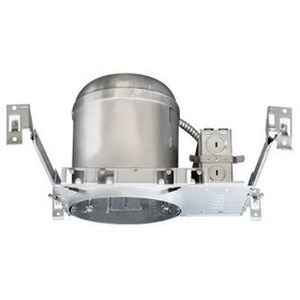 Elco Lighting Line voltage universal housing has integral thermal protector that guard against improper lamping. It supports 90-Watt incandescent lamp for energy efficiency and long life. It has adjustable socket bracket that allows for different lamp types/sizes and proper and consistent lamp positioning. The junction box is listed for through branch circuit wiring and has six 1/2-Inch knockouts with true pry-out slots for ease wiring. Its 7-1/2-Inch height allows for use in 2 x 8 constructions. Universal housing is UL listed for damp locations.